Summer Grilling is on ya’ll! 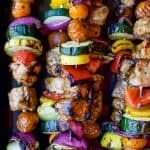 And these GRILLED BALSAMIC CHICKEN KABOBS should be first on your hit list! A healthy paleo grilling recipe only 251 calories a serving! To a small bowl add balsamic vinegar, dijon mustard, honey, dry basil, salt, and pepper. Whisk together and slowly add in the canola oil whisking the entire time. To a large bowl, add chicken cubes and half the balsamic mixture, reserve the rest. Stir to make sure all the chicken is coated. Cover with plastic wrap and place in the refrigerator for 20 minutes to marinade. Preheat grill to medium high heat (375-400 degrees F). Remove the chicken from the refrigerator and start to assemble the kabobs. Alternate veggies with chicken on a skewer until everything is used up. Place kabobs on the grill and grill each side for 3-4 minutes, until charred. Brush the remaining marinade on the kabobs for one last flavor burst. Grill for 2 more minutes.